TAKEphONE - Get it at 75% Off! Our regular MobileHeist offers provide Treonauts readers with outstanding deals on great products for a very limited time. This time around, our partner, ShSh Software, has agreed to offer a huge discount on their award-winning TAKEphONE for Palm OS. 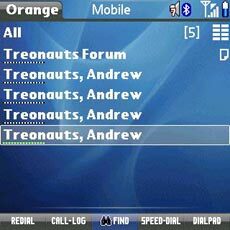 TAKEphONE v7.55 is a utility that greatly enhances the capabilities of Treo and Centro address books. TAKEphONE has been extensively reviewed and consistently receives accolades for improving search, dialing, emailing, and SMS on Palm-based smartphones. This application is a perennial best-seller that normally retails for $19.95 but for two days, this Thursday April 24 and Friday 25th (until 11:59 PST), we’re going to sell it for only $4.95. That’s a saving of $15.00 and a full 75% off the retail price! To get this terrific application at this incredible low price you just need to add TAKEphONE to your shopping cart – no coupon code required. As I mentioned in my original TAKEphONE review some two and a half years ago, this is one of the simplest and most complete Contacts/Phone replacement applications that I have come across and anybody yearning for a better solution than the built-in Contacts program in our Treo and Centro will quickly be won over by it. TAKEphONE has one of the most powerful “Find” functionalities and I particularly like its ability to _very_ quickly return the results of contact searches within up to ten fields including Last, First, Company, Title, Custom, Address, City, State, Country and Note. In this respect you can consider TAKEphONE to be a “Turbo” version of your Contacts as it’s not only extremely fast but also awesomely customizable to your particular needs. Among others there is also a powerful and extremly useful function in the Telephony Preferences that allows you to set a Calling Card profile through which (for example) all of your international calls can be automatically re-routed. This works phenomenally well and I use it almost daily to save money for all of my calls abroad. Additionally, this latest version 7.55 of TAKEphONE provides a very rich new user interface (screenshots below) which makes it a real pleasure to interact with on a daily basis. Also, if the high-res built-in skin is not to your liking you can replace it with any image of your choice as well as having the opportunity to choose your font colors, size and overall layout – there’s pretty much no part of TAKEphONE that you can’t personalize. 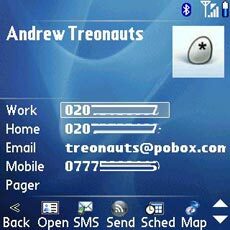 Overall, TAKEphONE has been one of my favourite Treo and Centro applications for years and it’s by far my top Editor’s Choice for Best Contacts Search Tool. It offers terrific value at its regular $19.95 price but with this $4.95 offer it’s an outright bargain – get it quickly. Separately, please remember that this month you can also add any other Centro & Treo Software to your cart and save 20% by using the coupon code BESTSELLERS. [Please note that this coupon is not valid for use in the Treo Accessories Store or Centro Accessories Store].